I’m glad to announce the first release of the Eclipse plugin for Hibernate Search. In this post I want to describe its features and ask you for any comments, positive or (even more important for me) negative. 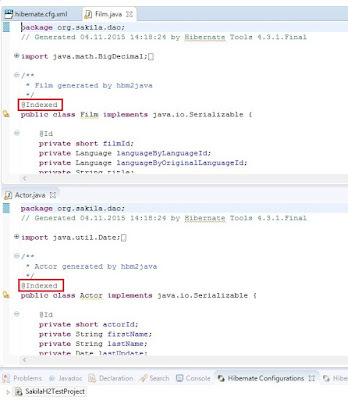 The plugin was made as a feature of jbosstools-hibernate plugin, which can be downloaded and installed on its own or together with the full JBoss Tools distribution. After that you can install the Hibernate Search plugin via the Eclipse Marketplace. All requirements, such as eclipse version and platform support, are listed in the link. 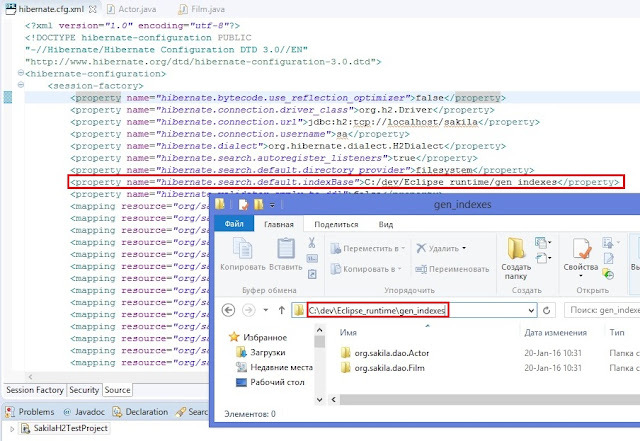 In order to work with Hibernate Search you have to set the Hibernate configuration properties hibernate.search.default.directory_provider and hibernate.search.default.indexBase. See also Getting started with Hibernate Search. Three options were added to the console configurations: Index rebuild, Explore documents and Try analysers. 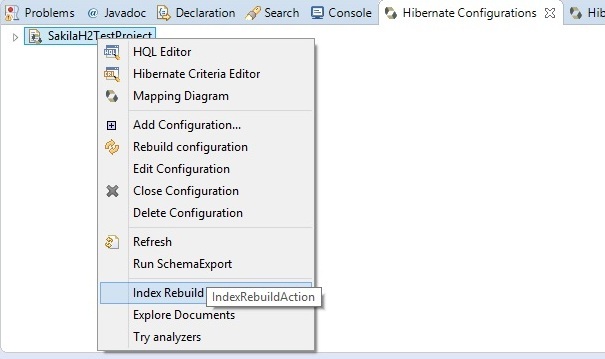 The option "Rebuild index" will do so by re-creating the Lucene index in the directory specified by the hibernate.search.default.indexBase property. The "try analyzers" instrument allows you to view the result of work of different Lucene Analyzers. The combo-box contains all classes in the workspace which extend org.apache.lucene.analysis.Analyzer, including custom implementations created by the user. While you type the text you want to analyse, the result immediately appears in the AnalysisResultTab view. One problem which you might have is that "Index rebuild" option seems to do nothing. As a temporary workaround try to set the Hibernate configuration property "hibernate.search.autoregister_listeners" to "true" explicitly. If you have any other problems, such as unexpected behaviour, strange windows with exceptions or any errors in the Error log view feel free to contact me directly anywhere or just create an issue in the plugin github page. Make options "Index rebuild" and "Explore documents" available not only for configurations, but also for concrete entities under session factory. 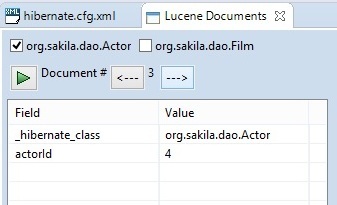 Make Lucene Documents view more comfortable to use and add there more features from Luke tool, for example, the ability to search over documents. Increasing stability of the plugin and implementing your suggestions!